Increasingly, public schools are considered off-limits for churches and church groups. Not so in Sweetwater, Tennessee. At their May meeting, the Sweetwater School Board recognized four churches that held their first Inasmuch United Sweetwater for the work they did on behalf of several of their schools in April. 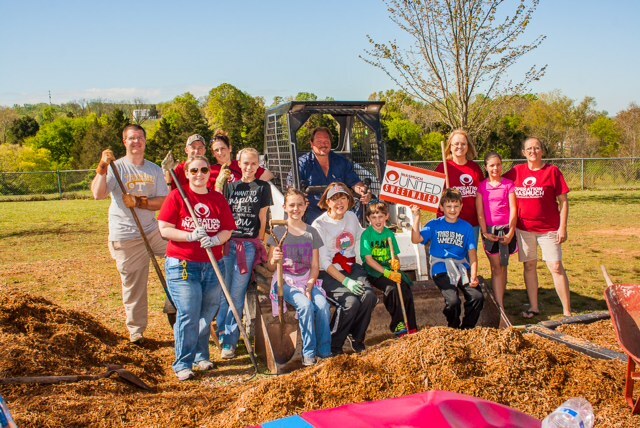 Three hundred volunteers from First Baptist, First Presbyterian, First United Methodist and First Assembly of God fanned out throughout the small town between Knoxville and Chattanooga conducting 26 Inasmuch projects and serving their community including work done at the schools. Knowing this, Carson-Newman University in Jefferson City, Tennessee, has promoted community service for all of their students and Inasmuch has been a major piece of this strategy. 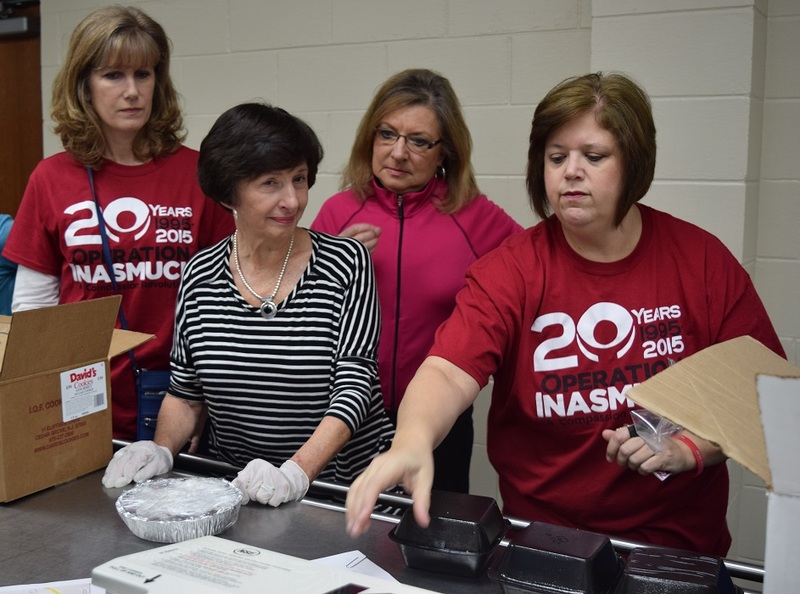 October 24 was the 10th Operation Inasmuch at Carson-Newman with more than 550 students and faculty involved. A special video was made for the occasion and it may be viewed at: Celebration Video. Pastor John Daugherty celebrating an Inasmuch Day in Fort Myers, Florida. For eight and a half years now that line has been more than a sound bite; it has been rock solid belief. God has indeed provided for Inasmuch. The most recent example is Rev. John Daugherty who accepted the full-time position of Associate Director with Inasmuch and began working July 1. Daugherty comes from Fort Myers, FL, where he served as Senior Pastor of City Gate Ministries, formerly First Baptist Church. He led the church to develop a number of ministries to people in need in Fort Myers and, in 2013, led his church and half a dozen others in downtown Fort Myers to conduct an Inasmuch United event. Their Facebook page tells the exciting story: Inasmuch United Fort Myers. In stark contrast to our current warm sunny days of June, Greene Baptist Church stands magnificent in the snowfall of January. Maybe you heard. The Northeast was hit especially hard by winter storms this year. Maine is no stranger to harsh winters but this year was harsher than most. 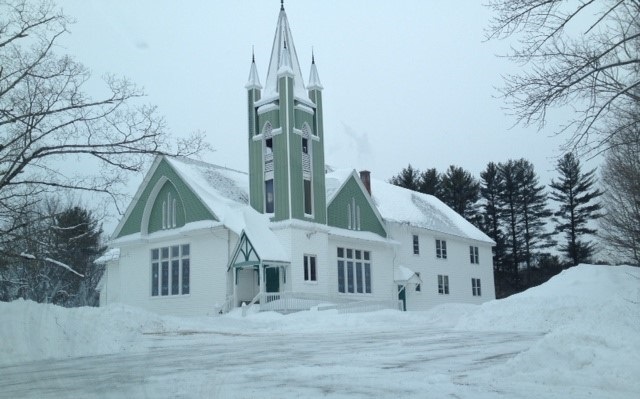 Even so, Greene Baptist Church in Greene, Maine, had David Crocker, Executive Director of Operation Inasmuch, in January to train them in how to conduct an Inasmuch Day. Garrison’s first encounter with Inasmuch was at University Baptist Church, Charlottesville, Virginia where he and his wife were long time members. When they moved to Radford to be closer to their son, it was only natural that they get involved in Inasmuch there, too. 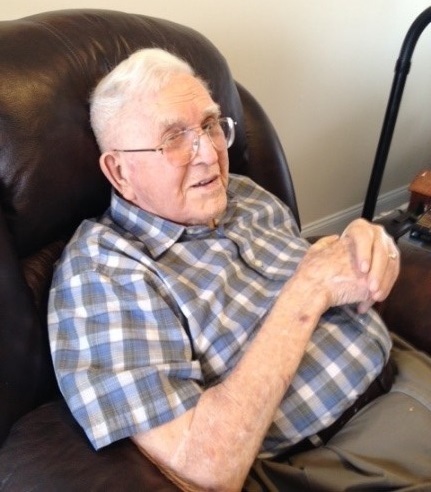 As a long-time Baptist deacon, he was well acquainted with serving others. His daughter says it has been a way of life for him. 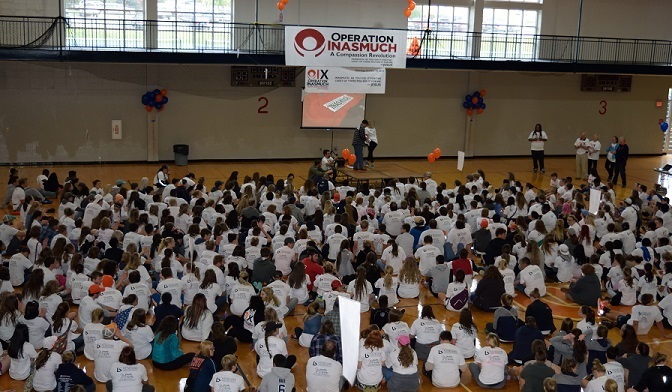 “We now have an entire generation of young people who have experienced Operation Inasmuch,” said Rev. John Cook, Pastor of Snyder Memorial Baptist Church, Fayetteville, North Carolina. 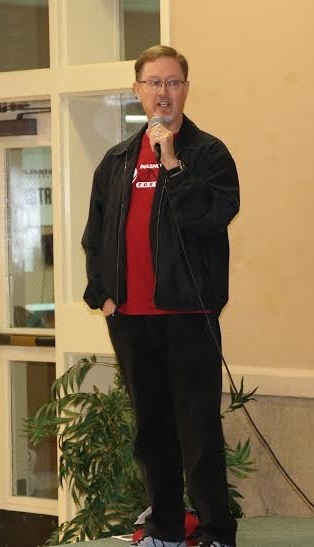 His comment came at the end of the morning worship service at Snyder Memorial on March 22 at which the 20th anniversary of Operation Inasmuch was celebrated. 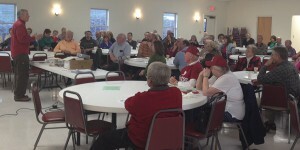 Susie Reeder offers instructions for the casserole delivery project. Some of the volunteers serving and those served gather for a group picture. Many churches are learning that they can impact their community with Inasmuch, but what about the world?! Congregations in Radford, Virginia, would answer in a resounding Yes! Four Radford churches (Baptist, Methodist, Christian and Presbyterian) conducted their first Inasmuch United event in September of 2014. The loaded container made its way from Knoxville, Tennessee, to Guatemala. In April a shipping container with 252,000 meals was sent from Knoxville, Tennessee to Guatemala. In June a team of volunteers from Central Baptist Church, Johnson City which included David Crocker, Executive Director of Operation Inasmuch and Corky Corcoran, member of the Inasmuch Board of Directors, gave out about 6,000 of those meals to people of three villages in rural Guatemala. The container was opened revealing the 252,000 meals. Unloading was hard but rewarding work. How much can one person do to impact his community? Ask Joel Singletary of Sumter, South Carolina. In April he and his wife, Libby, were honored by Sumter’s Mayor Joe McElveen for their volunteer work in Sumter—Libby for her countless hours spent at United Ministries serving wherever she can be helpful and Joel for his leadership in leading his church, Alice Drive Baptist Church, and 18 other congregations in Inasmuch United Sumter. From left, Mark Champagne, United Ministries director; Libby Singletary; Sumter Mayor Joe McElveen; and Joel Singletary. 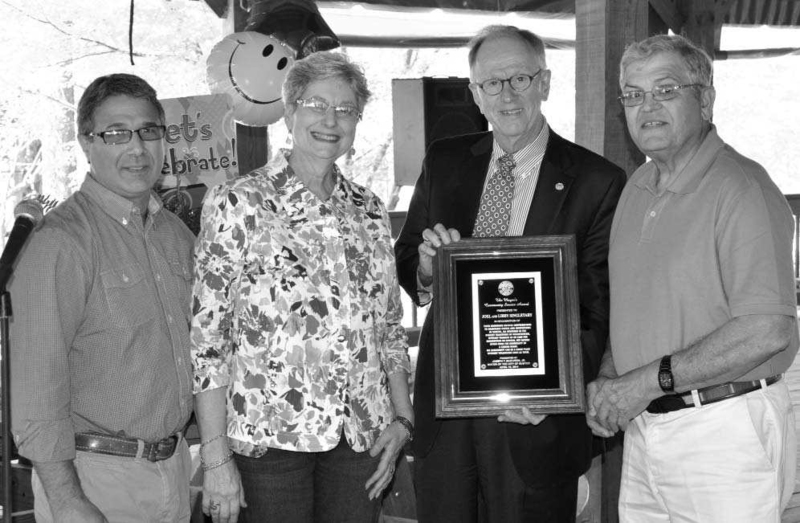 Joel and Libby Singletary received the Mayor’s Award for Outstanding Community Service. It began in 2009 when Joel’s pastor, Dr. Clay Smith of Alice Drive Baptist Church, showed Joel an article about Operation Inasmuch. He took several folk from his church to a Lutheran-sponsored Inasmuch training in the winter of 2009. Shortly thereafter, he led his church to conduct their first Inasmuch Day. The story is told in the video “Roosevelt’s Story” on the Inasmuch website: http://www.operationinasmuch.org/stories-of-the-revolution/roosevelts-story/. What’s faster than a speeding bullet, more interesting than a Dan Brown novel, and more challenging than an Army drill sergeant? No, It’s not Superman; just David Crocker zigzagging across Virginia telling the Inasmuch story and training dozens of churches to conduct Inasmuch events later this year. 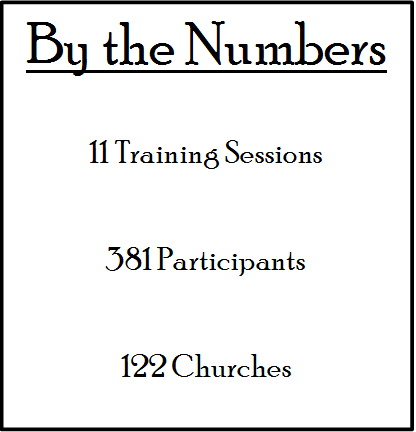 For two years the Inasmuch ministry has been working with church leaders in Virginia to plan and promote a statewide Inasmuch effort for the fall of 2014. The training sessions David conducted throughout the state-from Winchester in the north, to Hampton in the east, to Roanoke in the west and South Boston in the south-during the last half of March is the latest and most ambitious aspect of this plan. David Crocker addresses a full training session in Virginia during the statewide training blitz. Enthusiasm for Inasmuch was strong and participants at these training sessions were excited about mobilizing their congregation into their community. In more than one of the sessions there were people from churches that have past experience with Inasmuch and spoke favorably about their experiences. 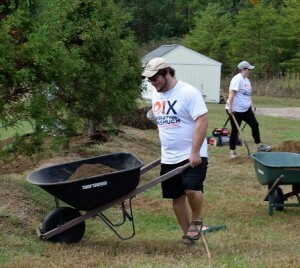 The state of Virginia is just one more place where God is using Operation Inasmuch to help His people become more externally focused and effective at demonstrating His love and grace . . . and He doesn’t have to have Superman’s help to do it! 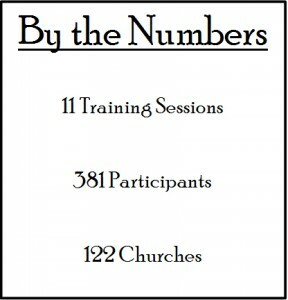 20% Increase in Attendance… WOW! Copyright © 2019 Operation Inasmuch. All rights reserved.